Nail polish in a spray can. A new product by Nails Inc, the first of it's kind, claims to be the worlds fastest manicure. I had to buy one!! 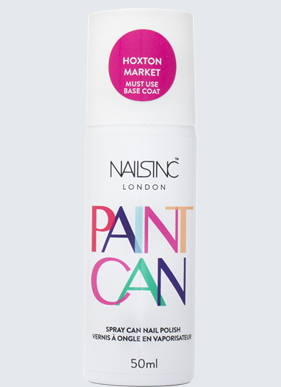 Each can is £10 on Nails Inc's website, and currently comes in 2 colours; Shoreditch Lane and Hoxton Market. I chose to buy Shoreditch Lane (the silver colour), as I thought I would wear this more often than the pink one. At this point your hands are covered in spray polish, but with warm water and soap you can then wash off the excess. ▲ Good formula, only requires 1 spray coat to be opaque. ▲ Easy, for people who struggle painting their nails, and making their manicure look neat it is perfect as wiping off the excess is very simple. ▲ Great for painting with your non-dominatant hand, I think a lot of people (including me sometimes), struggle with using brushes with your non-wiring hand. ▲ Dries very fast, but totally drying time does depend on the base & top coats as well. ▲ SO SHINY. The pigments in the spray are definitely unique. The first thing I noticed after applying the polish was how shiny/sparkly it was, compared to other silver polishes I own. ▼ Price, £10 is expensive compared to a lot of drug store polishes you can buy for £3-4. ▼ Lack of colour choices, I'm sure that Nails Inc will go on to create more colours, but as of right now the choices are limited to only silver or pink. It all comes done to personal preferences and your skill painting nails. If you enjoy collecting nail polishes like me, then DEFINITELY YES, because it will be something completely unique to your collection. If you are someone who struggles to neatly paint your nails, or struggles to paint with your non-dominant hand, then YES it is worth buying, you will get an even coverage and the same result on both hands. If you don't like silver or pink nail polish, then NO, wait to see if they bring out more colours. You can find both of these polishes and more information about them on Nails Inc's website here. 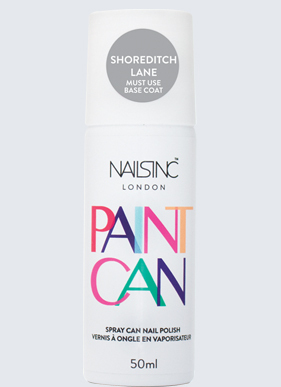 Have you tried these spray polishes? Let me know what you thought?